Two artists renovate their home and fill it with an eclectic Arts and Crafts collection. A history of the bungalow-era garage. 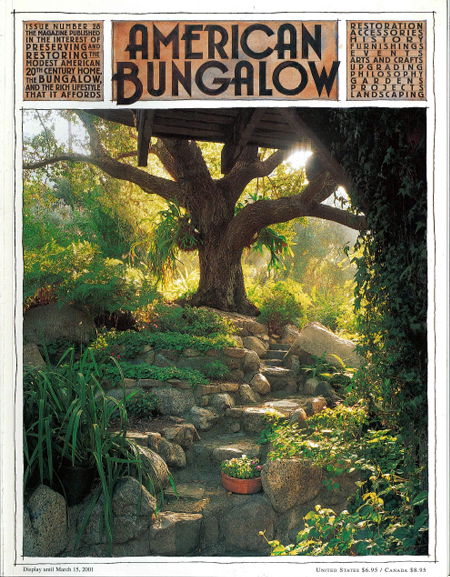 Two previously unknown cottages by the famous Pasadena architect. The continuing saga of painting our own bungalow. A new construction that presents a modest facade. Sweat equity turns a decaying bungalow into a real home. Fresh off the drawing board, a bungalow into a real home. Different approaches transform two typical bungalow interiors. Old-time lemon icebox cookies from the Pierpoint Inn. From Van Erp and Stickley to Heintz and Onodaga — a guide to collecting metalware. A cottage industry in Michigan taps into the Arts and Crafts market. Creating a real family home with honest, simple materials and handmade crafts.